After getting invaluable exposure at the Goa Premier League, coaches believe that Russia may become a force in the game in the next twenty years. Russian cricketers made headlines last month when they played in the T20 Goa Premier League (GPL) tournament. It was quite an experience for Indians to watch Russians playing cricket. The team from Moscow gained a lot of exposure although they lost to the vastly experienced Indian sides. In Russia, where cricket is neither played in stadiums nor shown on television, it is still seen as a weird game played in “Alice in Wonderland.” And no, it’s not a typo: Russians actually confuse cricket with croquet. And yet things are changing as the coach of Cricket Russia team Ashwani Chopra, commonly known as the father of Russian cricket among Indian expats, dreams big. “I want every school in Russia to play cricket,” he says. Chopra has been living in Russia for fifteen years, first as a student and then as a businessman. After his last business venture was hard hit presumably by ill-wishers, he thought of returning to India. However, fate managed to intervene and keep him in Russia. In 2012, Cricket Russia (formerly United Cricket League), an association of cricket players set up by Chopra along with several other Indian expats back in 2003, received long-awaited affiliation with the International Cricket Council (ICC). It was a major boost for Chopra as he could take up promotion of cricket as his full-time occupation and raise the exotic game for Russia to new heights. 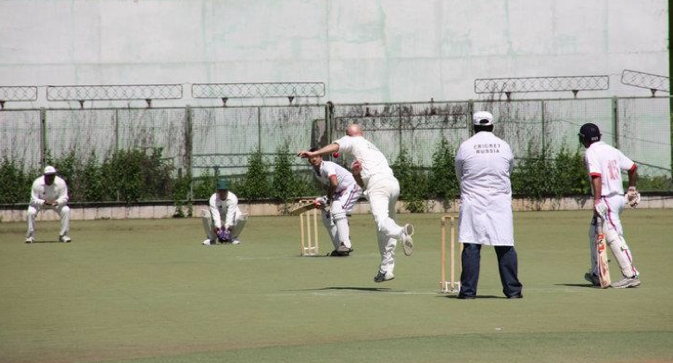 Cricket has been promoted in Russia since the 1990s. However, there was no common view among cricketers, most of them Indian, Pakistani and Sri Lankan expats, on whether cricket has to be played only among expats, or whether Russians, too, should get involved. It reached a point where several clubs which later formed Cricket Russia separated from Board of Control of Cricket in Russia (BCCR), a larger but non-official cricket organization. Cricket Russia is now the only body affiliated with the ICC. “Our motto was that in Russia too cricket should be played by the masses. In March 2012, we started our Cricket Academy, the training facility to teach Russian boys and girls from the age of ten to seventeen. There are over 600 people learning to play cricket all over Russia at present,” Chopra told RIR. Getting affiliation with the ICC was not an easy task for Cricket Russia founders. A lot of paper work was required to be done in the Russian language. “I had to translate all the terminology in cricket into Russian, each and every word. Well, now it helps as I teach kids in Russian as not everyone knows English,” Chopra says. Several years ago he was a Russian-language commentator for the T20 World Cup matches broadcasted by Eurosport, a satellite and cable network. Cricket Russia is now targeting schools in Moscow and other large cities to train children and set up age-group based school leagues. “We are starting new and exciting competitions in the year such as The Beach Cup and Moscow Sixes. This is being done to increase participation and ensure cricket is played throughout the year,” Chopra says. Cricket Russia currently has only three grounds in Moscow: at Locomotive stadium, in Karacharovo and close to Moscow Ring Road (MKAD). The tough point is that open grounds can be used only during the summer months while most of the year cricket players require indoor facilities. There aren’t many coaches available either. According to Chopra, he himself is coaching in Moscow with the help of several Russian trainers and a coach from South Africa. In the regions, however, cricket is driven solely by expat students. Currently Cricket Russia has more than 45 regional bodies and 20 more are being created, Chopra says. The association crossed the required minimum of 44 regional offices to be recognized as a pan-Russia organization last year which was probably the biggest achievement in the history of Russian cricket till now. According to Chopra, there are about 20-25 clubs set up by Indian students in Russia’s regions. As all these students are interested in playing organized cricket, they supported Cricket Russia as an official governing body from the beginning. “The tournaments that are part of Cricket Russia are recognized by the ICC. So by playing in our tournaments expat students get a chance to grow in cricket and have a future in cricket back home as well,” Chopra says. The T20 GPL tournament in Goa was the first time for that a Cricket Russia touring squad consisting of 8 Russians and 7 Indians played on Indian soil although the team has played seven tournaments across Europe over the past few years. Jude Cardozo, former first class cricketer from Goa and newly appointed consultant of Cricket Russia, notes the performance of Russian was not very successful as players need more expose to a better level and better standards of cricket. “Initially the players were very confident of their strength before coming to Goa, but then they saw the level of other teams. So they realize that they have to work hard,” Cardozo told RIR. Chopra admits that the team’s expectations in terms of performance were not very high either as the quality and standard of the league is very high with a majority of first class cricketers and IPL players participating. “We hoped that the Russian cricket team would understand and experience high quality cricket and know the hard work that is required to raise the standard of their game. I think this objective was fulfilled,” he adds. Having good connections in cricket community, Cardozo is now arranging visits of Goan cricket teams and coaches to Moscow. “First we were planning to bring a team of professionals but then we changed plans because their level is too high for Russian players. Now we are working out possibility to take a team of Goan doctors to play in Russia,” Cardozo adds. He believes Cricket Russia has to bring in more youngsters, children 10-12 years, by organizing interschool tournaments. “It will take 10 to 20 years for Russia to reach international level if we get those 10-year olds involved now. By the time they will reach 18-20 they will be competitive,” he says. As a former businessman Ashwani Chopra sees plenty of business opportunities cricket can bring to both countries. “If someday a Russian Premier League will start just as IPL, you can imagine the scope of business coming in with India providing technical know-how, equipment, coaches,” he says. “Cricket is the second most popular sport in the world in terms of viewership after football. Revenue generation is huge, no other sports can generate such revenues,” Chopra adds. For the 2015 ICC Cricket World Cup, the broadcasting rights were sold to Star Sports, for $2 Billion. For India’s largest domestic cricket tournament, the Indian Premier League (IPL), broadcasting rights are worth $1 billion. Convincing a common Russian who had as never seen cricket on ground or on a TV screen is definitely a task. Nevertheless, Cricket Russia’s founders believe the good argument is that as cricket is new in Russia, the chances of making it up to national team and representing Russia in a world championship is much higher than in any conventional sport.